Explanation: Gazing across this gorgeous skyscape, the Southern Cross and stars of the constellation Centaurus are seen above the outline of Mauna Loa (Long Mountain), planet Earth's largest volcano. 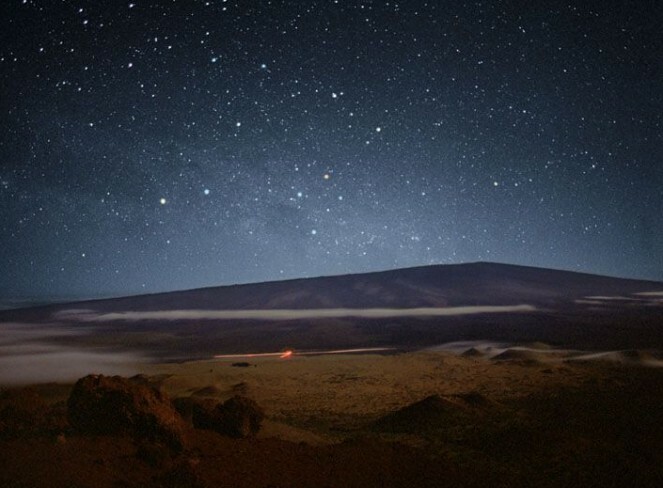 Unfamiliar to sky gazers north of about 25 degrees north latitude, the Southern Cross, constellation Crux, is near the horizon to the left of Mauna Loa's summit. A compact constellation of bright stars, the long axis of the cross conveniently points south toward the southern celestial pole. The top of the cross is marked by the lovely pale red star Gamma Crucis, which is in fact a red giant star about 120 light-years distant. Stars of the grand constellation Centaurus almost engulf the Southern Cross with blue giant Beta Centauri, and yellowish Alpha Centauri, appearing as the brightest stars to the left of Gamma Crucis. At a distance of 4.3 light-years, Alpha Centauri, the closest star to the Sun, is actually a triple star system which includes a star similar to the Sun. But what caused the reddish streaks in the foreground of this time exposure? Alas, it is the mundane glow of lights from cars (not molten lava!) traveling the road to Hilo, Hawaii.